The Zoom G3Xn Guitar Multi Effects Processor with Expression Pedal is a work of genius that puts total creative control in your hands and at your feet. Whatever style of music you play, and however you play it, this little beauty is packed full of features that ensure you won't be lacking in sounds and tools to execute a flawless performance. The G3Xn is equipped with a built-in expression pedal, which gives you further control over patches and FX parameters, as well as controlling volume level and filter sweeps. 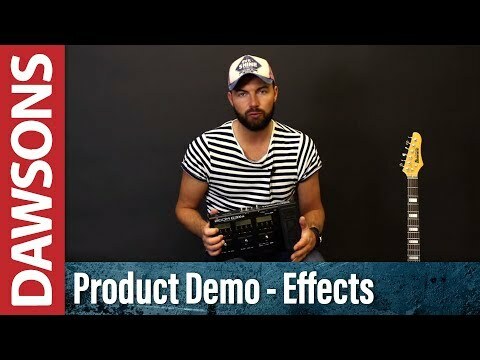 The G3Xn comes loaded with a 70 DSP effects (68 FX, 1 looper pedal, 1 rhythm pedal) that have been designed and implanted by professional guitarists (session players/band members for artists including: Megadeth, Smashing Pumpkins, Torche, Stevie Wonder). On top of this, the team at Zoom have worked meticulously to emulate 10 legendary amp/cabinet partnerships. They've even gone as far as to replicate the control layout of those amps/cabinets for greater realism. To make the G3Xn truly unique, you can combine up to seven effects and amp/cabinet models simultaneously, in any order you like. Effectively, you can hit the studio or the stage with hundreds of fully loaded pedalboards worth of tones in a single compact and easy-to-use unit. The G3Xn interface is set out in such a way as to make life as easy as possible for editing and setting up the unit to meet your requirements. A combination of three LCD displays gives you whole effect-chains at a glance, to that adding/deleting/changing effect can be done quickly. Useful when you can store 150 of your custom effects chains as patches. Stored within the Zoom G3Xn are 68 rhythm patterns, giving you a huge resource to draw on when practising alone, so that you can perfect your chops and/or improv skills, enabling you to perform like a pro. The onboard looper allows you to record and overdub phrases up to 80 seconds in length, with your chosen effects integrated for fun. The Looper also works with the rhythm patterns to quantize your loops in perfect sync. To ensure that you have absolutely no excuses, a built-in chromatic tuner allows you to bypass your patch during tuning, or mute the signal completely, to keep you in tune throughout each performance. Whether you're practising at home, recording in the studio, or playing to an adoring crowd, the G3Xn is equipped with flexible connections that allow you to adapt to your environment. As well as a standard 1/4-inch input, an auxiliary stereo input can be used for connecting an external sound source. The headphone output allows you to practise in silence, whilst dual mono or stereo L/R outputs and be used for sending direct feeds to guitar amps, PA systems, and audio interfaces. The useful Mic On/Off features enables you to optimise the G3Xn for use with a real amp and cab (Mic Off) as well as optimising for playthrough a PA system or recording direct with amp and cab emulators (Mic On). Zoom has thought of everything to keep you covered! Whether you have a Mac or Windows-based computer, ZOOM's free to download ZOOM Guitar Lab software gives you absolute control over your patches, as well as allowing you to download new effects and amp/cabinet emulators. The Patch Manager controls effects chains, whilst the Effect Manager allows you to rename and reorder custom patches. Simply connect the G3Xn to your computer via the USB port, and you're good to go. Posted on 06/02/2018 by Davvo This is well made, and really easy to use and program patches etc. The factory set patches are a bit of fun but you wouldn't seriously use half of them. This unit however does do a lot for the money, and if you using this for home practice with a cheap amp this is a great addition. However this just won't cut it for gigging as the sounds are too artificial and if you crank the volume up to gig levels it sounds frankly awful. Stick to separate pedals and pay for quality. Great service by Dawsons however nothing is too much trouble.